Prompting childhood memories of carnivals and clowns, the Carousel Lantern's unique silhouette and playful Lollipop Red finish is pure fun. 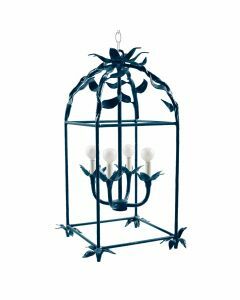 The delicate wrought iron frame is accented with Gold Leaf, giving it a festive pop. The lantern measures 14" in diameter and 30"H. Features a total of four lights with maximum wattage of 60 watts for each light (bulbs not included). Click on image for greater detail.